Sometimes, all you crave is a chocolate chip cookie. A chewy, chocolate-filled cookie satisfies even the craziest cravings. You know, those cravings that drive you mad and all you can think about is that cookie, crumbling in your mouth, with a ratio of 1:1 when it comes to cookie dough: chocolate chips. And no, I’m not pregnant. I just get crazy cravings for no reason. I can’t be the only one having these maddening cravings, right!? While the cravings subside, we make cookies. Cookies adapted from King Arthur Flour‘s Chewy Chocolate Chip recipe in their Baker’s Companion cookbook! And bare with me when I believe that substituting half the all-purpose flour for white whole wheat flour instantly converts a recipe to “healthy”. These cookies are studded with creamy cappuccino chips that I bought while at Blog & Bake in Vermont, PLUS I had some 70% Cacao Barry I had won from a giveaway over at Fresh New England. Both chocolates came together and made this intensely chewy, chocolate stuffed cookie! 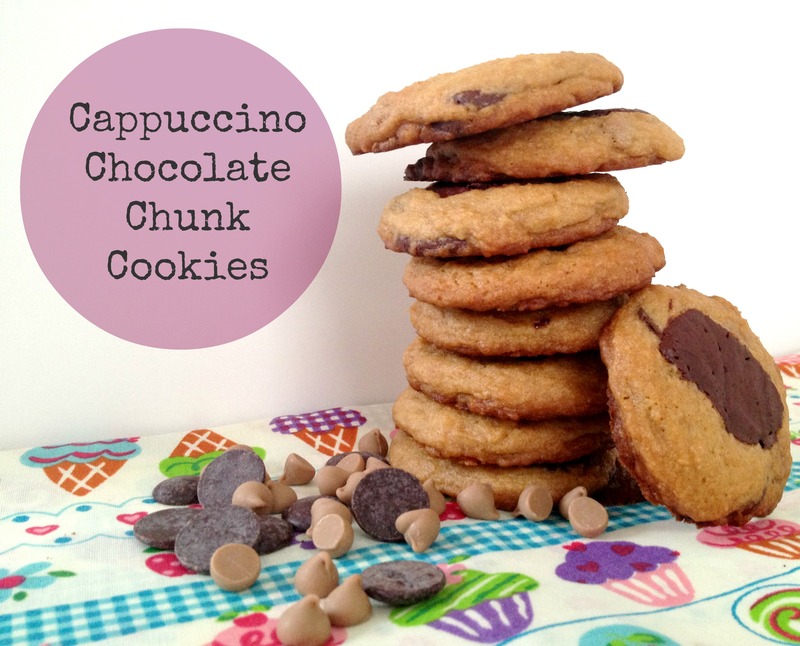 Oh and in case you’re wondering, here’s the link on where to get the Cappuccino Baking Chips. Adapted from King Arthur Flour's Chewy Chocolate Chip Cookies, these cookies won't last more than a day in your house! For extra coffee flavor, add 1 tablespoon of espresso powder to the dough. Beat butter, sugars, corn syrup, vanilla extract, and salt until light and fluffy (about 5 minutes). Sift together flours, baking powder, and baking soda to incorporate well. Add to wet ingredients and mix only until incorporated, do not over mix. Fold in cappuccino chips and chocolate chunks. Using a small ice cream scoop (or a spoon) place cookies on baking sheet and bake for 12 minutes, until golden brown. I’m curious to know: what’s YOUR favorite kind of cookie? I still don’t know where to buy cappuccino chips. Please enlighten me.. These cookies look and sound fabulous! I wish I had a dozen to eat with my morning coffee today. And I need to find some cappuccino chips stat so that I can make these. I totally agree with you on the 1:1 cookie:chocolate chip ratio. That’s the only way to make CCCs!